SCENE: The Editor’s office, less than a week ago. There is a desk in the centre of the room. There is an in-tray on the desk. It has a habit of disappearing, but is currently just empty. There is a clock on the wall. It reads 11:00. There are two chairs: a big one is behind the desk and a small one in front of it. Editor is sitting on the big chair and Sub-editor on the small one. Both are looking out of the window. The postman walks past and there is the sound of some letters being pushed through the letter-box. More letters follow, then more and finally more. They both go out of the office and return, each carrying a large bundle of letters. There is now also an out-tray on the desk. Sub-editor: I see the in-tray has got some company. Editor: Looks like it might come in handy. They put all the letters in the in-tray and sit down. Editor takes the first one, opens it and reads it. Sub-editor does the same with the second. Editor (reading next letter): This solver wonders whether highlighting the preamble would have been marked wrong if we had decided on one of the other ways of highlighting HARE in the grid. DISSOLVE to clock which now reads 12:45. Sub-editor (taking last letter from in-tray): This one is from a long-time solver who tilted the letters of HARE in SEARCH AREA in the grid and made sure they were in a straight line, thus fulfilling all the requirements of the preamble. That’s what Dave Hennings did. I thought it was far more stylish than the solution that we went for. I think I said so at the time. Editor (sneering at Sub-editor): Yes, you did! But at least Dave wasn’t an all-correct having made that laughable mistake with his Yellow Submarine highlighting. 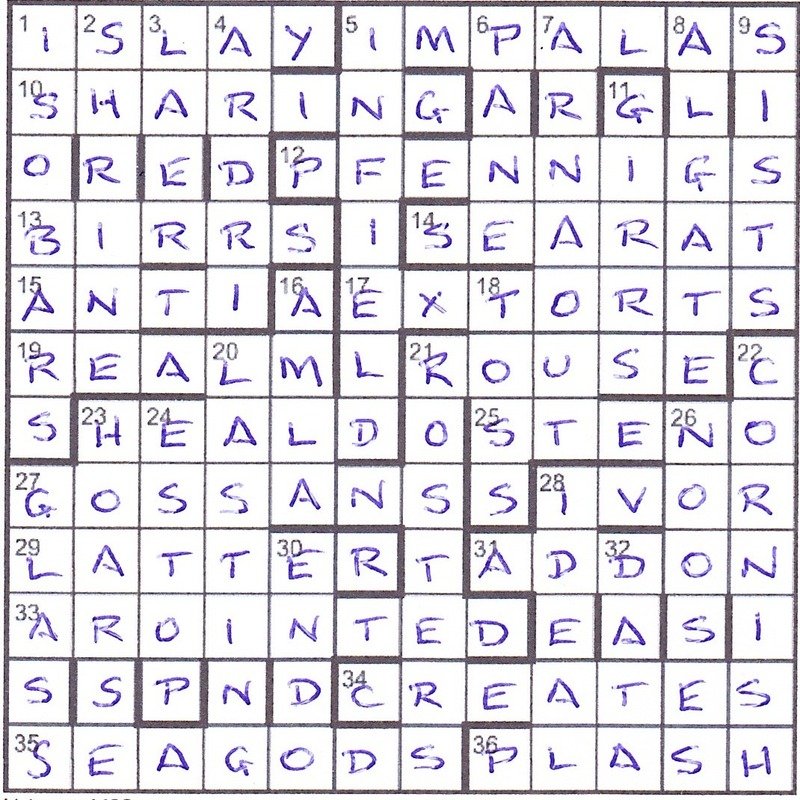 Plus, he was a prize-winner with Hedge-sparrow’s John Masefield puzzle. Still, I’ll buy Dave a couple of pints at the next Listener get-together. That’ll make him happy. Sub-editor puts the last letter in the out-tray, which slowly disappears. At the same time, another letter appears in the in-tray. Editor takes it. Any similarity to actual events is just wishful thinking. A much easier week from Phi, although he has set some toughies in the past. His last was two years ago with Haydn’s Farewell Symphony and before that, Mervyn Peake’s Gormenghast (tough). I enjoyed this second clue type, since the wordplay was to the words without their differing letter. For example, 2dn Australian temple recipe used in function (6) defined STRINE and SHRINE with R in SINE for the wordplay. I got that and the crossing SHARING/STARING fairly early in my solve. I wondered if all the differences were H/T when I got 17ac Encourages busy store to stock unknown screws (7): EXHORTS/EXTORTS and STORE* containing X.
I had my eye on the diagonals early on, especially with ITER… running down the NW–SE (ITERATIVELY?). However, it was deeply satisfying to finally discard that, and discover that taking the first/last letters of the extra words in order gave HEADS OR TAILS (running upwards in the right half of the grid) and its anagram I HERALD A TOSS (running down the left). I had heard of these anagrams many years ago, but had also, like many things, forgotten them. Thanks to Phi for a fairly gentle and enjoyable puzzle. If you want to read his setter’s blog, it’s already available on his web site Phi Crosswords. Poat has been compiling Listener crosswords for over a quarter of a century so I clearly don’t need to worry about his membership of the Setters’ Toping Club but, having read the short preamble of Buried Treasure, I skim the clues quickly to check that he retains his membership card. There is a brief foray into soft drinks at 39 across. I wonder whether that clue is totally fair on overseas solvers who don’t have the pleasure of those fizzy bottled and canned British soft drinks. ‘Relieve dreamer of soft drink to check case in Scotland (4)’ gave us FANTASIST with the FANTA removed. ‘A few pints on us? Volumes (7)’ produces the alcohol with QUART OS so ‘Cheers, Poat!’ obviously sticking with the beer. However, we have queried the rather strange A at the start of the clue and the OS for ‘on us’ and have a faint suspicion that something is going on in the clues as well as in the grid. Grid-filling goes full tilt, because of some lucky solves of long words, and suggestions from TEA when we have a few letters in place (like COUNTER-FLEURY – the wordplay led us to that ‘Set clue for university entry with charges going the other way (13)’ = CLUE FOR U ENTER* but I still don’t really understand the word). Soon our grid is three-quarters full, though we continue to wonder about rather strangely worded clues. It must have been difficult for Poat, for example, to find a clue beginning with H and finishing with E for BIRD (Hammerhead maybe circling daughter and wife (4)’ = D + RIB<). The north-east corner takes us longer as we have never heard of JOE BLOW, and even when we find him, we are not totally convinced that he matches with ‘For the average Aussie, a book picked up on the cheap (7, two words)’ Is this &Lit with JOE = average fellow + B = book + LOW = picked up on the cheap? We have been spotting clashes, often fairly generously clued, as we went along and now the other Numpty solves our doubt about RE AD EV ER ?? ?? RD (I was sure the last word had to be WORD!) ‘THIRD, he announces and that leads us to solve our last two clues YEASTS and HERDEN, to give the letters we need. He sneaks off to prepare the G and Ts and supper while I am left with the fiddly task of spotting all the unchecked letters then reading every third one of them. What do I find, ‘ONE OF THREE CLUE ACROSTICS’. I look again. There have to be three clue acrostics so I take every third initial letter and find THIS GOES NOWHERE/ FALSE TRAIL AGAIN and Eureka! CLOSE BY AMPTHILL. That, of course, is familiar and Wikipedia fills in all the details of that series of episodes that fascinated us thirty years ago. I fetch the book, Kit Williams’ Masquerade, from the basement and re-read it, confirming that our ultimate goal is the golden hare (maybe JACK?) and the grid-staring begins. And continues … and continues. I can find SEARCH AREA in the grid beginning at the S in the fifth cell but I can find no HARE in a straight line there. I can find ARCH – is that another word for a GOAL? Well, not in Chambers. There is only one HARE that is four letters in a straight line in the searcH AREa but that is in the preamble. Mr Green is adamant that he wishes those of us who live overseas and enter on home-printed documents to trim our grid with just the address details and one millimetre on each side (and to include a few used postage stamps if we can – that he donates to a charity). He surely can’t be happy if we send a highlighted preamble. I’m flummoxed and have to admit that this one has defeated me. Many thanks, anyway, Poat for a really meaty compilation. *which could have been called ‘X doesn’t Mark the Spot’. So my reading of the Preamble is that it is really saying: “Having followed the trail, solvers must highlight its ultimate goal in the searcH AREa (four consecutive letters in a straight line). And highlight it in the Preamble, not in the Grid! Let’s hope I am right, or this blog is going to look pretty dopey! It definitely meets the ‘spec’ of the Preamble. My next thought was for our esteemed marker. As many of you will know he appreciates receiving puzzle entries as closely trimmed as possible to the puzzle grid edges to avoid him having to do the same many hundreds of times over – today that’s going to be tricky, I thought! Back to the beginning. This was a great puzzle – thanks Poat! Whenever one reads ‘buried treasure’ or similar in a puzzle then it’s odds on that, in some way or other, ‘X’ will mark the spot. Nothing wrong with that, of course, but what a delight when that isn’t the case. And what a trail it was! Firstly, organise clashing entries to make a phrase of interest: this gives READ EVERY THIRD. Secondly, the Preamble says to apply this statement to the unchecked letters. Highlight all such letters on my rough copy and the 3rd, 6th etc of them spell out: ONE OF THREE CLUE ACROSTICS. Thirdly, acrostics. I knew that sometimes these were messages sometimes spelt out with first letters and sometimes last letters. Try both in each clue – nothing. Try it across every clue, looking at the start of the 1st, 4th,… clues and it reads THIS GOES NOWHERE! Now the 2nd, 5th,…: FALSE TRAIL AGAIN! And the 3rd, 6th,…: CLOSE BY AMPTHILL. So what does that mean? Many of you will already have been aware of the late 1970s book ‘Masquerade’ by Kit Williams with a built-in treasure trail and real buried treasure. If not then Grandma Google will help – what an interesting story! But what was finally buried, close by Ampthill (the book’s final clue), was a (golden) hare. So, back to ‘Buried Treasure’, and fourthly, now catch your Hare. Is Poat teasing us? I was almost disappointed that BAUD, BAWD, PIKA & PUSS weren’t there in 3/4 form as well! But no HARE or synonym. Now what? And eventually I twigged – see Bus Service above! 1) I guess someone out there might try and argue that ‘its ultimate goaL..’’ in the preamble referred to the letter L shape starting with Col6’s H then going down one and across right one. Can’t see how to justify “(four consecutive letters in a straight line)” part of the Preamble there, though. Discount. 2) Also, starting with the S at 4d one can spell out SEARCH AREA via a couple of routes thru touching cells, finishing on Row 6 heading left thru the double-entry at 24. Might that be part of the solution, perhaps? No straight lines again though so highlighting HARE around a reversed ‘L’ can’t count. Discount this one too. 3) The hare in the original book was called Jack. Could the J in Row 1 have some relevance? Could the Catherine of Aragon’s monument’s shadow from the original book somehow be recreated in the grid? Surely too difficult to emulate ‘noon on the autumnal equinox’ in a grid. Discount.